Whoever said that moving house was stressful didn't experience the double whammy of building a new house from scratch and moving out of your existing one with nowhere to move to. Despite all of this we had a wonderful week in Scotland with our friends Tony and Jude. 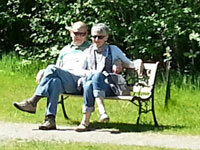 They made us very welcome, giving us an opportunity to unwind and recharge our batteries. Thankfully we could repay their hospitality with Steve helping Jude with her website and Jane knitting some cushion covers. The month of course has been dominated by our house sale, move preparation and the sale of Jane's mum's house. We've also been busy handing over our village responsibilities with Jane's village newsletter now safely transferred to someone else and Steve has started training someone in managing the village website. Next month looks even busier but together we will survive. We have never been on a train overnight and after much discussion and comparison with the cost of flying we booked our seats. We opted for seats rather than beds because we wanted to keep below the cost of driving or flying. We left Northampton at 9.30 pm heading for Crewe where we picked up the Caledonian Sleeper. The seats were very comfortable so we managed to stretch out and get some sleep. Jane laid across two empty seats after a couple of hours. 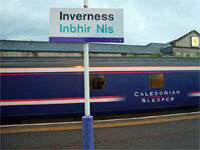 It was great to roll into at Inverness at 8.30 am not quite fresh but at least presentable. We were met by our friends Tony & Jude who whisked us off to their very comfortable home. We were staying with our good friends Tony & Jude. Each time we visit we become closer and closer helped by the fact that they are superb hosts; nothing is too much trouble but at the same time it is all very relaxed. 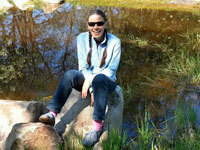 The weather was excellent and the sun shone on most days as can be seen by the sunglasses. Jane managed to find a spot in the shade and pretended to be a little mermaid but we weren’t fooled by that big smile and the sunglasses – we knew it was Jane. The pond behind her is the mill pond for Knockando Mill and was crammed with tadpoles which Jane wanted to take home – still a child at heart. Searching through rock pools is always fascinating even if you find nothing. 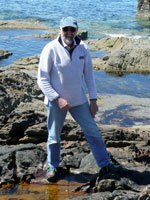 Steve was enjoying the sunshine and the challenge of walking along the shoreline. The water was very clear and shortly after scrambling over rocks and shingle we had the great fortune to see the dolphins. This was a first for us. One evening we went into Inverness to the cinema and a meal out. As we walked back to the car after a great evening we spotted an otter swimming up stream. 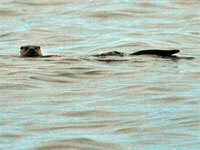 The last time we saw an otter was in another city in another country – Florence. It seems that otters are really happy in towns and long may it be so. The Moray coast line is superb with rocks and sandy beaches around every bay. On one of our walks we spotted black shapes swimming towards Inverness and it was only when these shapes leapt from the water we realised they were a pod of dolphins. 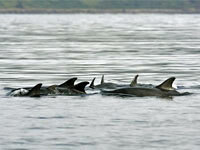 We’ve never seen dolphins in the wild before and it was an amazing sight. They weren’t very close but it had us gripped and we wouldn't move away until they'd finished playing and were out of sight. 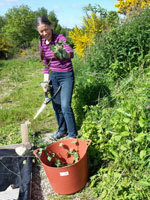 Whenever there was a few moments to spare then Jane enjoyed the clean Scottish air and helped in Tony & Jude’s garden. Tony was hoping to make a nettle fertilizer so Jane started to cut down some nettles and Steve collected them up ready for a soaking in a large bin. We managed to avoid too many nettle stings and we wouldn’t like to drink the final brew but apparently the plants love it. 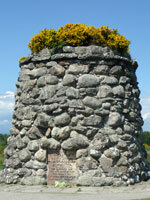 Culloden - Battle or Massacre? Tony & Jude took us to Culloden where the final battle between the Jacobite forces of Bonny Prince Charlie and the English met. It was a fascinating experience with the exhibition area set out so that you could follow the build up to the battle as seen from the English and the Scottish side. At one point the Scottish army had made its way down as far as Derby and were only a few days away from London. In the end the battle was fought with the Scottish clans, a tired army, and a well rested and disciplined English army under the Duke of Cumberland. The battle lasted less than an hour but the Scottish loses were very high and brought an end to the Jacobite rebellion. The exhibition centre was excellent, particularly the immersive film where you stood in the middle of the room with English troops on one side and Jacobites on the other. It was noisy and scary and gave you a very good idea of how it must have been on the day. The Beech tree was close to other houses so we paid for a professional to fell the tree and we were left with a very large trunk to cut up. Nick damaged his chain saw because running around inside the tree was a load of barbed wire. It's amazing how trees will just grow round anything that gets in their way. We hope to have enough wood for our log burner for several years to come but we need to store it somewhere dry and get it cut ready for the winter. We spent a long weekend up on our Marker Rasen site to clear some of the ground under the trees and prepare a woodland walk. 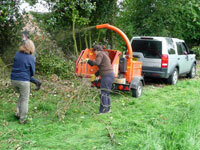 There were several piles of brush that had to be shredded so after Nick and Val turned up on site with the hired shredder in tow we immediately got on with the job. The shredder is an amazing piece of kit that just kept munching through the stuff no matter how quickly we fed it. 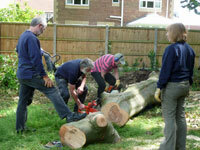 Dave & Lucie joined us later and before long we had worked our way through Beech, Holly and Hawthorn brush. It took virtually all day but we finished just after 4pm absolutely knackered and very satisfied. 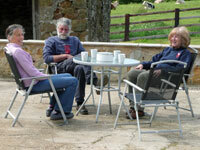 It wasn’t all hard work as we spent the evenings sitting outside drinking and relaxing. Dave and Lucie lit a barbecue one evening and the weather was unbelievably good. As we approached the longest day we could sit outside until well after 9pm - past Dave’s bedtime. By the end of the four days we had cleared all of what we had planned and it had opened our plots considerably. There’s still more work to be done amongst the trees but we will leave that for when the birds have finished nesting and the building is nearer completion. He was well up to scratch with some old stuff and a lot from his latest album. Wow! What a night with a really tight supporting band he had us tapping our feet and a few people were on their feet and dancing which is considered racy for sleepy, old Northampton. 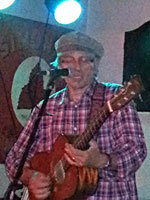 Needless to say we handed over a crisp tenner and walked away with his latest CD. Now transferred onto smartphones for playing on the move. Jane went to Liverpool at the end of the month with Viv our next door neighbour to join 7,000 other choristers in the Echo arena. One superb photo which did not register on the phone was a poster with the Rock Choir and The Who both appearing on the same day! It was a long day starting at 9.00am to board the coach, arriving back in Northampton at 11.00pm. With 2 hours spare in Liverpool to see the sights they just managed to cross the River Mersey and back before rushing to their seats. A superb time was had by all, the volume when all these choirs sang together was quite emotional. 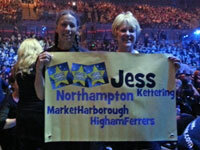 They were pleased that their choir mistress Jess was in full view on the stage, even leading the choir on one number. She was clearly visible on the huge screens either side of the stage. They had banners so she could identify where her choir was seated.